If you have perused Better Homes & Gardens recently, you may have come across their fantastic write up on Space-Saving Kitchen Appliances. 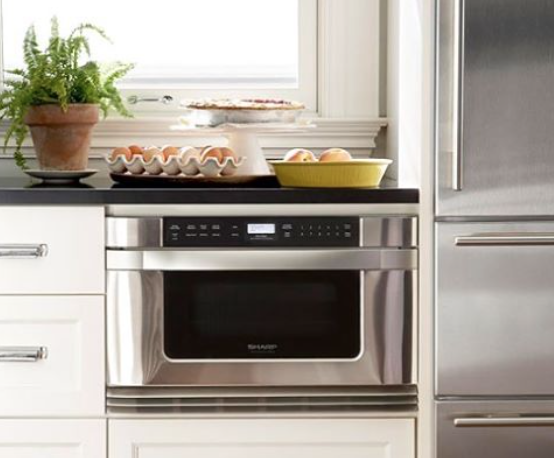 We were thrilled to see the Sharp SMD2470AS model 24-inch Stainless Steel Microwave Drawer featured as one of the recommended built-in appliances. 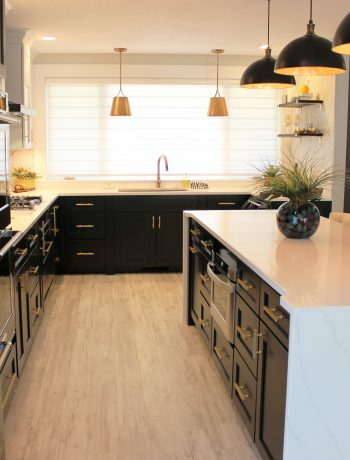 While built-in microwaves and appliances are one solve to remove clutter from counters, this article got us thinking about other ways to make room in our kitchens. We have all felt the frustration of too little room in our kitchens! Whether it’s preparing that annual holiday meal or hosting an after-school cooking decorating club, counterpace is coveted! From stirring to chopping to mixing, any kitchen task is easier and more enjoyable with more room. But apart from upgrading to a new home or taking up a major remodel, how can we create more space? What are the biggest culprits of wasted counter top surface area? Bulky appliances like microwaves and toasters are the first things that come quickly to our minds! 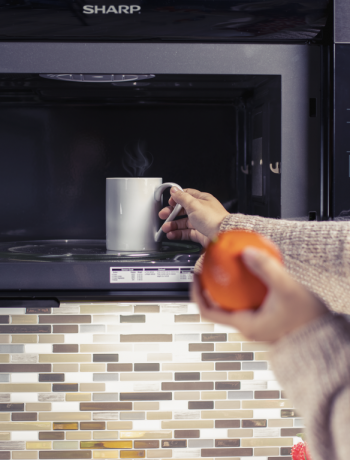 Purchase a built-in microwave capable of more than just re-heating and defrosting! Many units are available today with convection cooking and grilling capabilities as well as more programmed settings for things such as baked potatoes, pasta and more. With just one space-saving appliance, you can warm up your food, or cook it from scratch, eliminating the need to transfer hot pots and pans to the oven or stovetop. marshmallows without needing help to reach. It doesn’t matter if your kitchen is great or small; everyone is looking for more real estate in the most important room in the house. And cabinets can fill up quickly! The use of a suspended pot rack can dramatically free up cabinet space, which in turn, frees up counter space. Pot racks combine vintage appeal with efficient storage. 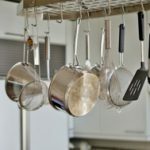 They do away with the need to arrange and rearrange the order of your pots so they can all fit comfortably in your cabinet and eliminate the time it takes you to search through that cabinet to find the right pot. The pot rack provides easy access and visibility to kitchens of all sizes. Rolling carts are a kitchen’s best friend. They can roll in when you need them, and roll away when you don’t. They can double for extra counter space, a space-saving appliance shelf, or a preparation station. 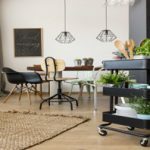 You can roll them into any location that is convenient and even use them to transport hot just-out-of-the-oven items to the table. Here is one of our very favorites! 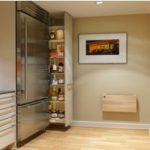 These modern pantries can fit into the smallest of spaces and make finding spices that usually get hidden in the back much easier. Storing pantry items on shelves that slide out creates easy access to all contents. The pantry can remain pulled out for the duration of cooking, so no more opening and closing of kitchen cabinets at eye level. 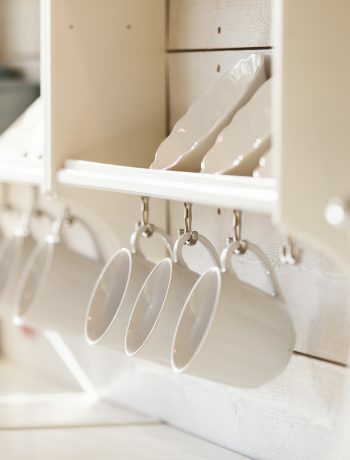 We love these simple solves for saving space! What are some of your tips and tricks? Share in the comments for a chance to be feature in one of our upcoming Tip Tuesdays for your space saving savvy! Nothing Gray Here: Making Bold Decisions for Your Dream Kitchen Pizza In A Cup?